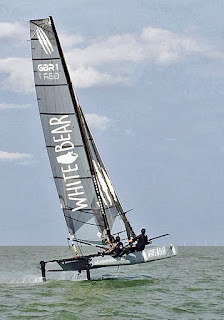 I received a pair of mails saying the M20 White Bear pictured in previous post is a rocket. On September 6 we published a link to a technical doc. Now you can see that full report embedded below. Image left by Kyle Stoneham , uploaded to our FB Page. I still think it has too much systems, but some big names are involved in the project, and is interesting to know their thoughts on the concept. I also sent a mail to William for him to report an update on the project on performance & systems. People behind the heavy modified M20: "...William Sunnucks has been seeking a way to combine moth and catamaran technology since learning to sail a Moth in 2009. Further inspired by the 2013 C Class championship in Falmouth, he drew up the canted T foil concept to be built on the Vampire as the test bed. The concept was developed by fluid dynamicist Kevin Ellway, designer of the Exocet International Moth, the first to be designed completely using mathematical models. Scores of virtual moth designs were “flown” before putting the final design into production, and the same general approach has been taken with the Vampire project. He is now working on rig developments to get the best out of the platform. The foils have been built in Brightlingsea Essex by Graham Eeles..." Read complete Doc below.